A daredevil woman who suffers from Parkinson’s disease raised more than £1,000 for charity by braving a wing walk on an aircraft flying at 800ft. Charmaine Poundes (52), who was diagnosed with the debilitating condition in 2013, said she felt hardly any nerves during her recent challenge in aid of Parkinson’s UK, which carries out research and supports sufferers. The mum-of-one was accompanied on the day by boyfriend, Phil, and some friends as she took on the fundraiser at Selby Airfield in Yorkshire. She was strapped in securely to the top of the wing of a Spearman bi-plane before it took off and flew around the area for 10 minutes. 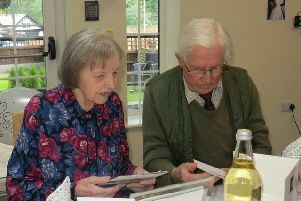 The charity’s coffers have also been swelled by £406 from a coffee morning held in Melton Library by the town’s Parkinson’s support group - around 30 people meet with the group every third Thursday in the month at The Edge community centre in Dalby Road.